Based in Berlin Germany, Soultrain is an exceptional vocal talent in his late twenties, who has already had massive underground success in his musical career so far. Thanks to his Jamaican heritage he has been involved with Reggae music since his early childhood. He was also been deeply influenced by Hiphop and the Breakbeat/Jungle scene. His musical history inspired him from an early age to compose music and rap over instrumentals. In 1993 – at a time when Jungle music was just getting accepted Worldwide, Soultrain was amongst the very first artists shaping the scene in Germany. In 1995 he performed on a Jungle soundsystem in Mannheim and only a year later he was booked on legendary German rave festivals Future and Meditation. 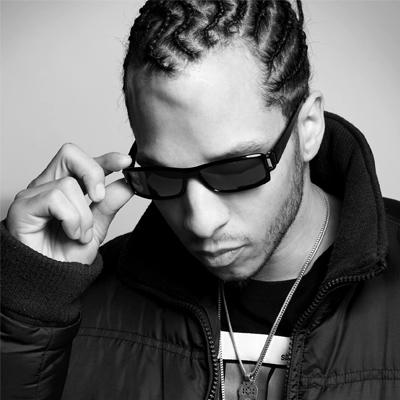 He has also performed on, Hiphop Open, Summerjam/PopKomm, Splash, Love Parade, Urban Art Forms and many more. His explosive performances on these events is how he eventually came to the attention of Navigator (Freestylers). In 2002, Navigator recruited Soultrain as a member of the now legendary Rawhill Cru, which also included ragga MC greats like Tenor Fly, Daddy Freddy and the Ragga Twins. He then recorded a verse with Navi and MC $pyda on the DnB/Jungle smash-hit Mo' Fire and also featured in the video.Mo' Fire became an anthem and stormed straight to No.1 in the UK Dance Charts selling 60.000 copies. The video was on heavy rotation on Channel U (now Channel AKA) and several other TV stations around the world. In 2000, 2002, 2007, 2008 and 2009 Soultrain was awarded 'Best National MC' by the Future Music Awards. He holds the record in Germany after winning this award five times. In 2006, Soultrain moved to Berlin. From this moment on he has been focusing on his career as a solo artist. In 2008 he started to work with Berlin based record label IM Music and produced the Reggae hit, Heart of a Champion. The video for this track is also a testament to his live performance skills and can currently be viewed on youtube. Throughout his career, Soultrain has honed and developed himself into a unique artist with an unmistakable voice and style! He manages to integrate new and experimental trends, while still remaining loyal to his reggae roots and long time fans.